As Peshtemal City, the leading peshtemal manufacturer and peshtemal wholesaler we have been reviewing our premium quality and latest fashion hammam towel designs during Summer 2018. This week’s article will be a little bit different since the Autumn 2018 is here! This week, we will be reviewing peshtemals that are used in different areas of life: Peshtemal Bathrobes! Peshtemals are not only towels but also an important cultural element in Turkish history! As a responsible peshtemal manufacturer and wholesaler, we carried peshtemals a step further and designed peshtemal bathrobes and blankets! We combined the high-quality features of peshtemals with elegant designs and manufactured Diamond Bathrobe, Kids Bathrobe, Pamukkale Bathrobe and more for your comfort. Let’s begin our review with Diamond Bathrobe! Diamond Bathrobe is an elegant and premium quality Peshtemal Bathrobe! Woven 100% from premium quality, ring spun Turkish cotton yarns, Diamond Bathrobe carries all the characteristics of the peshtemals we manufacture and wholesale. Diamond Bathrobe is extremely light-weight yet highly absorbent. It is quick drying, soft and durable. Diamond Bathrobe has a combination of brilliant diamond shapes and vibrant colors on its design. We offer a wide color spectrum for this comfortable Peshtemal Bathrobe for you to choose the color you desire for your dream bathrobe! With such an elegant design and comfortable texture, Diamond Bathrobe is not only a perfect Peshtemal Bathrobe but also a perfect decorative item. Diamond Bathrobe’s light-weight and thin texture makes it easy-to-pack. Being easy-to-pack, comfortable, and elegant Diamond Bathrobe is perfect for traveling purposes also! To learn more about one of our premium quality Peshtemal Bathrobe designs visit Diamond Bathrobe product page! Designed for our little friends, Kids Bathrobe is a high quality Peshtemal Bathrobe! As a responsible peshtemal manufacturer and wholesaler, we didn’t forget our little friends! Designed for kids’ comfort, Kids Bathrobe is woven 100% from premium quality ring spun Turkish cotton yarns. Dyed by the best dye-house in Denizli/TURKEY, Kids Bathrobe doesn’t contain any harmful materials on its texture, thus can be confidently used! Kids Bathrobe is highly absorbent, extremely quick drying, soft, light-weight and durable! It offers everything that you would expect from a bathrobe! Designed for the joy of our little friends, Kids Bathrobe is a vibrant Peshtemal Bathrobe. The wide color spectrum we offer for Kids Bathrobe enables it to be cool, cute, and a lively friend after a relaxing bath! 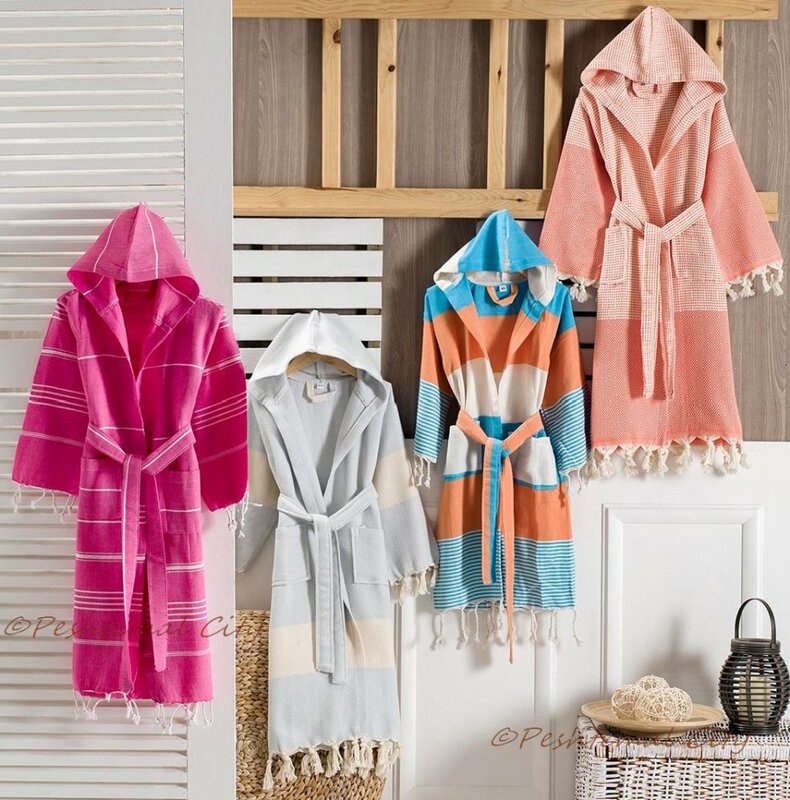 To learn more about the most comfortable Peshtemal Bathrobe we manufacture visit Kids Bathrobe product page! Inspired by the beauty of Pamukkale/DENIZLI, Pamukkale Peshtemal is an eye-catching and comfortable peshtemal bathrobe! Inspired by one of the Wonders of the World, Pamukkale, Pamukkale Bathrobe has an elegant design. White blocks for cotton-like travertines of Pamukkale, colorful blocks for its varicolored, lively surroundings, and thin fringes for the stalactites of Pamukkale! Woven 100% from premium quality ring spun Turkish cotton yarns, Pamukkale Bathrobe is a premium quality Peshtemal Bathrobe. It is highly absorbent, quick drying, soft, light, and durable. Manufactured for your comfort, the elegant design and high quality texture of Pamukkale Bathrobe made it one of our top-selling Peshtemal Bathrobes! Not only comfortable, but also elegant, Pamukkale Bathrobe is a perfect decorative item. It would breathe life into your bathroom with its lively design. It is also perfect for your travels with its easy-to-pack texture. 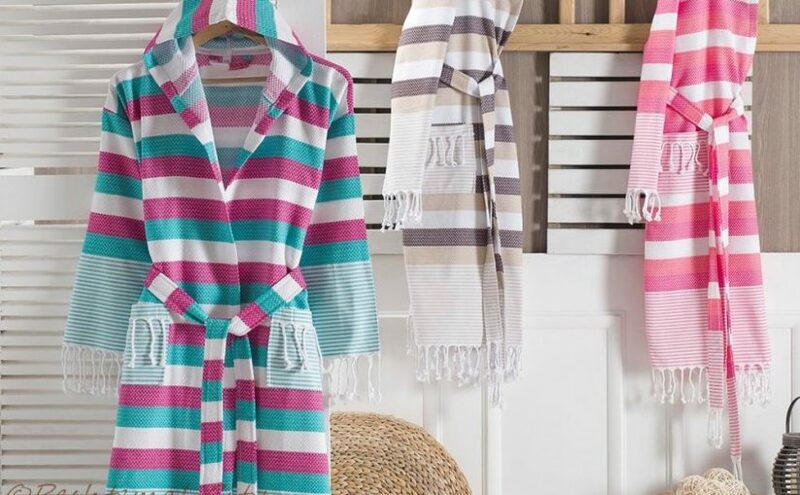 To learn more about one of our top-selling Peshtemal Bathrobe designs visit Pamukkale Bathrobe product page! Before we finish our Peshtemal Bathrobe review, we suggest you visit our “What is Peshtemal?” page for a comprehensive article on the historical and cultural aspects of peshtemals, hammam towels, fouta towels, and Turkish towels! Also be sure to check our “products” page to discover our premium quality peshtemal collection! Don’t hesitate to “contact us” for any questions and your peshtemal wholesale needs!